I have always looked forward to joining the TNF100 every year. When the news that this year it’s going back to Baguio, I didn’t have any second thoughts about registering even though it would mean enduring almost 30 hours of body pains, testing my mental toughness, running under the scorching heat of the sun and the freezing cold temperatures in the mountains. Yes, these are the kind of things that I anticipate whenever I think of TNF100! 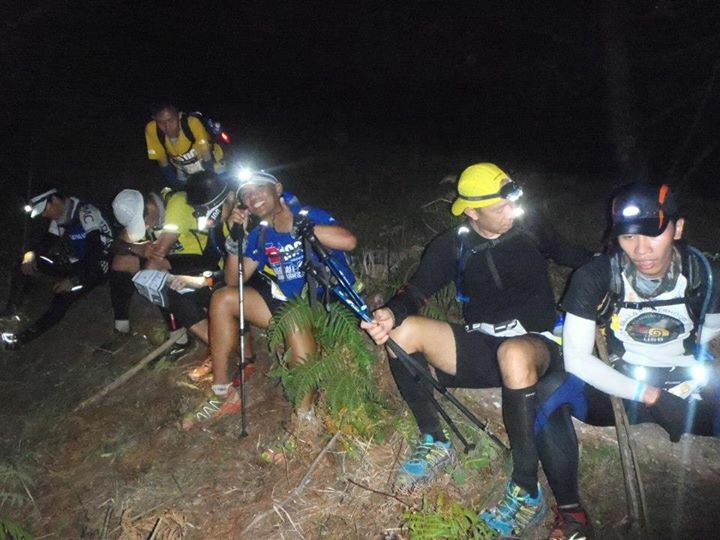 In April, I was back in Baguio for this year’s edition of TNF100. The early morning air was chilly and the race venue exuded an exciting ambiance as I, along with other 100k category participants waited for the gun start. By 3 o’clock in the morning, we have set off for another race that’s about to unfold. Whilst it was still dark, the route seemed all too familiar to me. The cold and crisp scent of the morning air filled my lungs with every breath. And with every step, the memories of the TNF100 back in 2014 were like a movie unreeling in front of me. Arriving in Baguio on a rainy Friday afternoon, I headed to the race briefing venue to pick up my race kit, deposit my drop bag, and for the last minute gear check to ensure that I got everything I needed for the race. Before heading back to the DBP Convention Center where I was staying (I shared a room with Edrick and Shamal), I dropped by a 24-hour convenient store for a few food items. Before retiring for the night, I prepared my running gear – race bib, hydration gear, light jacket, sunblock, trail food and energy gels. As it has been my practice in the last two years, I also packed some chocolates and bite-size gelatin and tucked them in my hydration pack. That surely weighed a bit heavier. I got mixed emotions as I took under the cover. Dozing off to sleep, I felt excited for the race but at the same time a bit intimidated just thinking about the route. Perhaps it was the fear of missing the gun start, I woke up earlier than my 1am alarm! After taking a light breakfast, I gathered my gear and headed down to the gate. It took me a while to get a cab to take me to the race venue at Camp John Hay. The race venue was getting packed with runners mostly in the 100 kilometre category and spectators who were as excited as the runners were. I’m glad to see my friend Gladice with her son Nikko at the start line, who were on a vacation for the weekend. The most awaited hour came, and together with the rest of the participants, I was treading the concrete road going further away from the start line. The concrete roads turned to trails planked by towering trees bushes. Lights emanating from the headlamps and red blinkers illuminating the pitch dark night looked like stars on a clear evening sky. At this early stage of the race, runners were clumped in groups – the lead pack, the middle group and the ones taking their time. Passing the first Aid Station meant that I’ve already taken at least 8 kilometres. That’s just a small portion of what lies ahead. We passed by a few villages, ran through the bridges, and walked along the farms. Dogs growling and barking as we passed by. The terrain was a mix of some flats, but mostly uphill and downhill slopes, which seemed a little too familiar for me. The large groups of runners have thinned down into smaller packs running in single file. The cold wind was cutting through my skin and was already feeling a bit numb. Up ahead, some distant villages would come into view as specks of light came off from the houses and lamp posts. Dawn was forthcoming. The sky was painted dark purple and orange hues. In no time, the world came into view with greens, and lots of greens. It was an absolutely refreshing view. Whilst making a long descent coming from the Aid Station 2 (at 19th kilometre), I could already see what lies ahead. I anticipated how tough the next 10 kilometres would be. About two hundred metres or so, the long climb commenced with a slight inclination, which drastically and dramatically shifted to steep climb. So steep that I was almost crawling, my knees touching my chin. As the ascent was getting tougher, the temperature was also creeping up as the sun rays pierced through trees. Each step was getting heavier that I had to pause for thirty seconds every now and then. The cold water from my hydration pack provided so much relief. There were only a few of us walking past each other every time we took a short break. The climb seemed endless. I would let out a sigh of relieve whenever the terrain presented a slightly flatter or downhill course. And I wasn’t even through a quarter of the race route! Thanks to the race marshals, though they were limited in number, there were stationed strategically in critical points to ensure that runners were guided and accounted for accordingly, and they’re the ones who gave us the extra push we needed. The sight of concrete pavement after a seemingly endless trail was totally a breather. Up ahead, there’s the towering telco relay station. The locals call it the radar. I stopped by the wooden hut and joined the other runners who were having a short break, exchanging stories and laughters. I picked up my gear and went on passing by people and children by the roadside. Looking at their faces, I can’t guess if they find us weird running a crazy 100 kilometres. I arrived at the 3rd Aid Station in Ampucao (at 30.3km) three hours earlier for the 8am cut-off. After I checked in, I refilled my hydration gear, refuelled whilst catching up with a friends. Once a bit rested, I got my gear and went on my way. The Mt. Ulap part of the trail route going to AS4 down to AS5 is up next! Every trail has a story to tell. Perhaps, this is the reason why many runners have gone to the mountains not only to run away from the busy streets of the metro but also to listen the story of the trails. Be detached from the noise and dark fumes in the city, and be awed by the amazing beauty of nature as you take each step of the trail. See how beautiful the sunrise is as you ascend to the peak. Have your own tale to share when you join the Soleus Cross Country Challenge! Scroll down for the race details. You may also register via Bank Deposit. 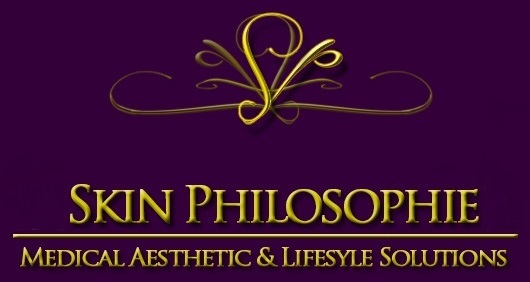 An email confirmation will be sent once bank deposit has been validated. Water stations will be strategically positioned along the route. Please bring personal hydration bottles and hydration packs, trail food, energy gels and personal hydration needs. See you at the trails!!! 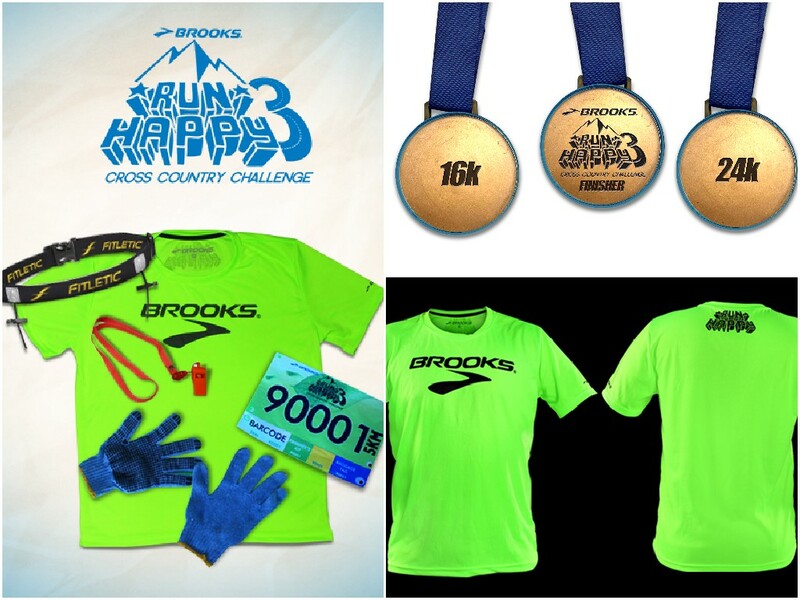 Brooks Run Happy 3: The Cross Country Challenge! Summer is not just about the sun, the sea and the beach. It’s about Fun and Adventure. 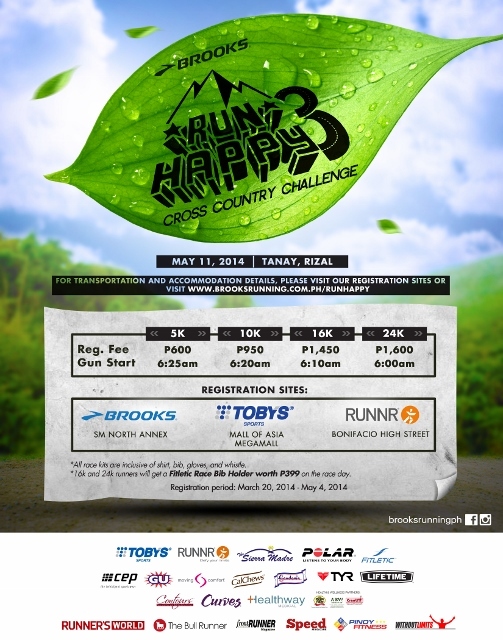 This summer, experience the thrilling adventure in a one – of – a – kind race as Brooks Run Happy 3 brings you to the magnificent views of the mountains of Tanay, Rizal. 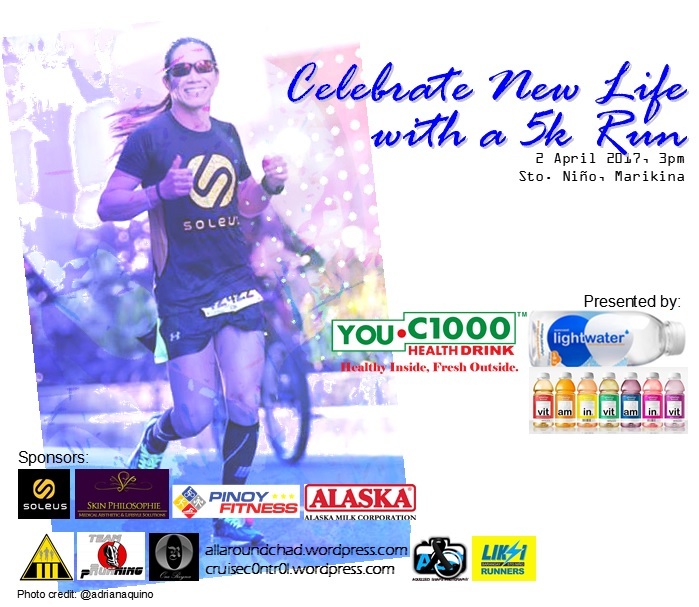 On May 11, 2014, join us in a 5k, 10k, 16k or 24k distance challenge. The nature is going to take you to an unexploited race course which you will surely enjoy! 16k and 24k will receive an additional Fitletic Race Bib Holder on race day. Participants can avail of the Transportation and Hotel Accommodation upon registration. Please visit www.brooksrunning.com.ph/runhappy for details. Medals await the 16k and 24k finishers!